We believe that Porcine Zona Pellucida (PZP) is the best tool available to control the growth rate of wild horse and burro herds. As is the case with most drugs, PZP is not perfect. However, we feel that any side effects (real, perceived or hyped) pale in comparison to the negative impacts imposed by round-up and removal strategies. Porcine Zona Pellucida (PZP) is an immunocontraceptive that is used to control the reproductive rate of some mammalian species, including horses, deer and elephants. It has been in use since the 1980’s. PZP is a vaccine derived from slaughterhouse pig ovaries (yes, we’d prefer this wasn’t the case). When injected into a female mammal this foreign protein induces an immune response that results in the generation of antibodies to combat the protein. Some of these antibodies attach to the sperm receptors on the zona pellucida of the target animal’s eggs and thereby prevent fertilization. ZonaStat-H – The Science and Conservation Center manufactures ZonaStat-H, otherwise known as “native PZP.” It is the product we use to treat the Onaqui Mountain Herd. PZP-22 – Is comprised of a combination of native PZP and PZP that is incorporated into lactide-glycolide pellets that are designed to dissolve in the host’s body slowly over time. It contains both a primer and booster dose. The hope was that it would provide at least 22 months (hence, it’s name) of pregnancy prevention with a single injection, but the results have been more on par with native PZP. The Science and Conservation Center in Billings, Montana manufactures the PZP that we use, which is called ZonaStat-H. The Center also provides training courses for people who are interested in becoming certified to administer PZP. Dr. Jay Kirkpatrick (deceased) was the head of The Science and Conservation Center and was an authority on the manufacture and use of PZP to control wild horse populations, as well as other wild animals. He performed a lot of research by treating the horses of Assateague Island with PZP. To reach full efficacy, a wild equid requires two doses of PZP to reach an approximate 96% resiliency to becoming pregnant in the year after treatment. A primer dose and the booster dose use the same PZP, but each requires a different adjuvant. The primer and booster dose need to be given at least two weeks apart. And, the booster dose needs to be given at least 1-2 weeks prior to breeding activity. We typically deliver primers in the Fall, then go back and dart with boosters in the early Spring. A number of the mares of the Onaqui were treated with PZP-22 and released during prior round-ups. They are marked with the BLM neck freeze brand, and a hip brand. They only require boosters each year. The brands on this mare indicate she was treated with PZP-22 in 2012 and released. She was gathered as part of an operation where other horses were removed from the range. The picture was taken in 2016, so it is obvious that her fertility treatment wore off. PZP can be delivered by syringe if the wild horse is being held captive, or can be delivered remotely by dart in the wild. 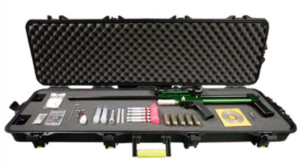 Dart delivery systems range from blowguns, to CO2-powered tubes, to rifles and pistols that may be CO2 or cartridge powered. Typically, you need to get within about 50 meters of a wild horse or burro to accurately deliver a dart. is the green piece on the needle of the dart in this picture. The cost of ZonaStatH (native PZP) is about $26 per dose. We don’t use PZP-22, so are not certain of the cost, but have heard that it is about $300 per dose (when comparing costs, remember that PZP-22 incorporates the primer and booster into one dose, and you only have to treat the animal once). 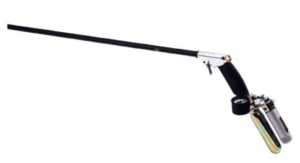 Dose by darting in the field: This requires purchase of the PZP and a dart (about $30 combined), plus the time and expenses for the darter. When the BLM uses volunteers, such as our organization, it doesn’t incur additional costs (but we do). When a BLM employee darts a horse, the darters time and costs (vehicle, etc.) should be calculated into the total cost per dose. Dose when gathered and released: Sometimes, during a gather and removal operation, some mares are treated with PZP and released. Typically, they are treated with PZP-22 (about $300) and released. The cost of this type of treatment is mostly just the cost of the dose, since the gather and removal is the main focus of the operation. Dose when gathered and held, then treated again, and released: Lately, we’ve been hearing that it costs $2,600 to treat a horse with PZP. This figure is a bit misleading, and is sometimes taken to mean the cost of delivering a dose in the field by dart gun. This is not accurate. The $2,600 figure comes from when the BLM gathers a wild horse by helicopter, transfers it to a holding pen, injects a primer dose of PZP, holds and feeds the horse for 2-4 weeks, delivers a booster dose of PZP, then releases the horse back to the range. Dose by bait/water trap: This is when a wild horse is trapped in a pen and a dose of PZP is delivered. This is, so far, a fairly infrequent scenario, and we don’t know the costs. However, we’d like to see it more frequently applied. 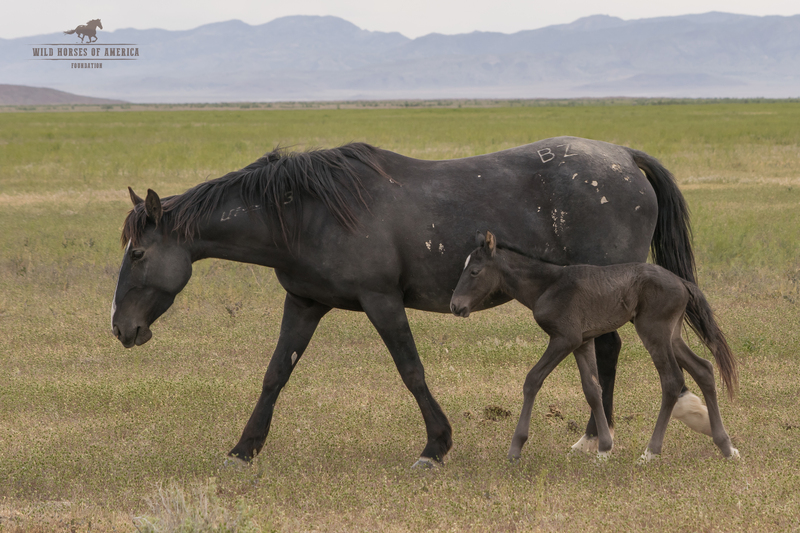 While PZP darts might seem like the “silver bullet” of wild horse and burro reproductive control, it is not quite so. While some herds are fairly easy to dart, many are not. Many wild horses will run at first site of a human on foot, or at the approach of a vehicle. With that said, there are many groups (such as ours), who are willing to try to dart the more wily horses. Ghillie suits, bait/water trapping, and other methods are part of our plans. Mostly, we just need a big “go-ahead” from the BLM. We won’t mention by name those groups who are against the use of PZP to control wild horse herd growth, but we will say that we are not impressed by them: Their obfuscation, and lack of real-world problem solving, means that more and more wild horses and burros will be rounded-up and removed from their native ranges. The one thing we will address, on this front, is the topic of how PZP is registered with the EPA.